Last night I was at a little birthday party for our friend George Caldwell. Above is a picture of him with his wife, the glamorous and perfect Connie, that I took at our friend Gary's house last winter. George Caldwell is a noted jazz pianist. A noted jazz pianist, get it? He is currently instrumental, ahem, in a show in Pittsburgh about Ella Fitzgerald. Ella Fitzgerald makes an appearance in my book, I am not sure if I ever mentioned that. Her path crossed Leonard Pennario's once backstage in Texas and it is a neat story. George drove in from Pittsburgh for his birthday and soon he has to drive out again to resume playing the piano in the show. Several things were great about last night. One was that one of the other guests was the son of the noted (hee hee) Chicago jazz pianist Gene Esposito. This being Buffalo where hockey is in the air I kept saying Phil Esposito. Ha, ha! "Why do I keep saying Phil Esposito?" I said finally. "Who is Phil Esposito?" Of course he turns out to be a hockey player. 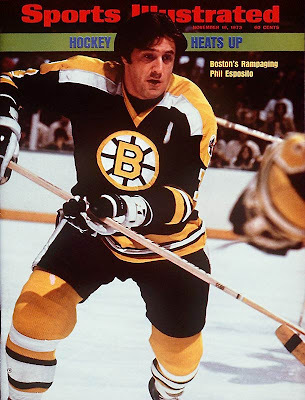 Here is a picture of Phil Esposito. Ha, ha! It is amazing that Gene Esposito's son did not crown me. That is an expression my mother always used when we were kids. "I'm going to crown you!" It was not a nice thing! George Caldwell knew Gene Esposito's son not because of their shared jazz roots but because they happen to live across the street from each other here in Buffalo. That is a detail I love! The son's name is Genero but they call him Gino. Howard played an entire magnificent set on the piano and then George Caldwell played. And here is something else great. Next to the piano was a pile of George's music and on top of the fake books was the Bach-Busoni Chaconne. That is Bach's great Chaconne for solo violin arranged for piano by Ferruccio Busoni! Busoni made these difficult and wonderful arrangements of Bach. Pennario used to love to play them, I know that. It is a privilege just to be in the same room with someone who totes around Bach-Busoni as it turns out George does. It does the heart good just to see a score like that lying there. Score! Listen to me. I keep thinking about hockey! I said, "George, give us some Bach-Busoni." And he began to play it for us. And everyone fell silent and we sat there and sipped our wine and listened to the Chaconne. After that George made a speech about Bach and what a hep cat he was and how he was the original jazz man. And Phil Esposito's son chimed in in agreement. Did I say Phil Esposito? I meant Gene Esposito. Sounds like a great night indeed! "...the original jazz man" Now that is 'original', lol! Mary, is Connie also known as the MYSTERIOUS ZELDA? Anonymous, yes, Connie is the Mysterious Zelda. You know her, no? Larry, I am sure that Bach is smiling down from on high being referred to as the original jazz man!